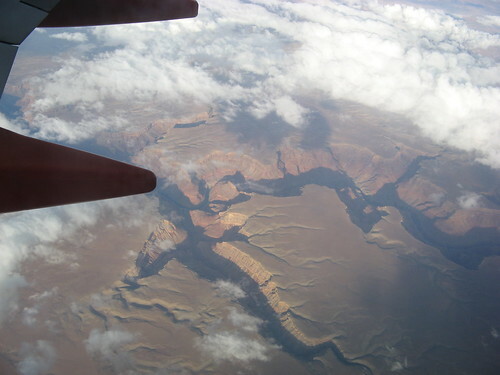 My Southwest Airlines route to Salt Lake City for Outdoor Retailer routed me first through Phoenix, so the flight to Salt Lake City passed directly over the Grand Canyon. It was also late evening, so I had excellent light. How big is the Grand Canyon? It can fill your viewfinder from seven miles up. Looks so ‘small’ and easy to tackle from this viewpoint! hah! Planes do interesting things over the Canyon. I’ve watched commercial jets do s-turns, so both sides of the plane got a view. And then there was 727 that dropped down to near rim level. Not sure what that was about. While the Canyon is nice from the air, it is much, much better on the ground. When I see things like this it reminds me we serve a very amazing God! Man ya gotta give props to Paul and Babe, even if he *was* just being lazy and dragging that axe. The vastness of US wilderness always amazes me. In Japan it is difficult to find a ridge with no lights of at least a small town glittering up from the valley below. Awesome view there! The Salt Lake City seems really amazing from this height, doesn’t it?